A trail worth exploring is the Viking Trail of Newfoundland and Labrador. The Great Northern Peninsula and the Southern Labrador Coast are alive with curiosities. Northern Newfoundland has been attracting visitors for hundreds- nay, thousands- of years. Highway 430 now runs north of Deer Lake. This road is known more commonly as the Viking Trail, and across the Strait of Belle Isle to Labrador, the trail continues as far North as Mary's Harbour. The biggest attractions along the Viking Trail is Gros Morne National Park, Icebergs, Humpback Whales, Vikings, French Shore and Battle Harbour. The Vikings came by sail, and all others that followed carried on the tradition until the late nineteen sixties. Until then, the Northern Peninsula was only accessible by boat. Route 430, now known as the Viking Trail, was built in 1967. Just over 400 kilometers of (now) paved road takes you from Deer Lake to Cape Onion, about as far North as you can go before tumbling into the icy North Atlantic. On the Labrador side of the Strait of Belle Isle, route 510 is paved as far as Red Bay, where a newly opened gravel road begins its 300 kilometer journey north. To drive the Viking Trail is to take a drive back through time. 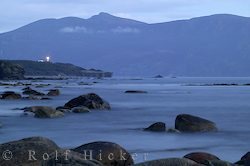 Though the Vikings left long ago, taking their ancient ways with them, the people of this peninsula and Southern Labrador still eke out a living from the land and sea. While modern vessels ply the waters for crab, shrimp, and lobster, there remain people who work sealskin and smoke salmon the old fashioned way. The people here are resourceful. Where can you see gardens planted along the roadside 50 kilometers from any town? Only here, along the Viking Trail. Coastal land is barren and rocky, and the plants that manage to take root here are mostly stunted versions of their full potential. To make anything grow, people have turned their backs to the sea and headed inland. When the machines came through in the 60s, clearing land to build route 430, backhoes and tractors churned up the topsoil all along what is now the main artery to and from the peninsula. Where better than here to grow a garden? These plots of all sizes line the roads at the tip of the Northern Peninsula. Fences and scarecrows do their best to keep hungry moose and caribou out of the crops. These four-legged vegetarians are the only thieves gardeners have to worry about here. 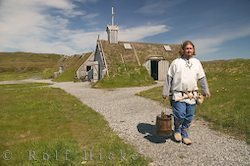 L'Anse aux Meadows is the tip of the Northern Peninsula, but by no means is it the end of the Viking Trail. 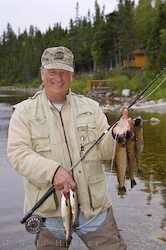 The real gems of the Viking Trail are off the beaten path, down the French Shore and across the Strait of Belle Isle to the Labrador coastal drive. The French had their heyday along the East side of the peninsula, and the communities that remain along this French Shore are proud of their origins. In Croque, a few determined Frenchmen carved their names and date in granite, their names are still visible today: 1868 POMONE; 1862 ROLAND. Other french communities along the French coast are St. Julien's, Conche and Englee just to name a few. The famous Gros Morne National Park in the lower reaches of the Viking Trail has been designated a UNESCO World Heritage Site and is a mecca for outdoor enthusiasts. Hiking, boat tours, bird and whale watching is only a glimpse of what this stunning park has to offer. Late in the year Gros Morne National Park becomes a winter wonderland and is great for skiing and snowmobiling activities. On the Labrador side of the Straits, there's a treasure around every turn. Yellow sand beaches, mountains, salmon rivers, and rocky barrens play host to the treasures of Pinware Provincial Park and Battle Harbour. Campers at Pinware will find themselves at the mouth of a great salmon river. Capelin roll on one side of a sandy finger of land while the lee side is a deceivingly inviting sandy-bottomed body of water where the river meets the sea. The estuary's water is cold and brackish but the Fishing is good. Farther upstream hopeful folks cast their fly rods into the rapids. The tiny island on which Battle Harbour is situated, was once the busiest port of call on Labrador's coast. It was here Dr. Grenfell set up the first hospital in Northern Newfoundland. Since 1991, the Battle Harbour Historic Trust has been working to restore the original buildings, some dating as far back as the mid 1700s. The town never had more than 300 permanent residents, but its sheltered harbour has played host to and continues to greet thousands of fishermen and adventurers alike. You can stay the night in one of the restored homes, or take the hour long cruise to the island for a day trip. Those famous Labrador flies don't swarm as thick out here where an ocean breeze tends to keeps them at bay. The Labrador Coastal Drive website has extensive travel and tourism information, while the Viking Trail tourism website highlights some other attractions of the Viking Trail. Tuckamore Lodge situated in Main Brook is a great place to stay while visiting the Northern Peninsula. You'll have easy access to the French Shore, L'Anse-Aux-Meadows, St. Anthony, and the Strait of Belle Isle, and be just an hour's drive away from the Labrador ferry. In Labrador, a night at Battle Harbour is a real treat. 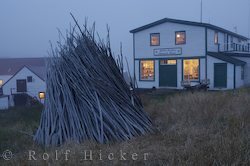 Be sure to check out our extensive selection of pictures and photos about the Viking Trail, Newfoundland and Labrador.